Movie making is a creative process where every step has to be synchronized for creating magic on screen. Film scripting is a crucial part of movie making, and forms the basis of entire screenplay and production. Since, the script has to be available to all people involved in the complex process of movie production; movie script transcription becomes all the more important. One of the key aspects when it comes to transcribing movie script is the need to create a time-coded transcription. This way, you will be able to virtually see the dialogue intervals and timing in every scene while transcription. This time stamping also becomes important for subtitling, which helps your movie reach a wider audience. Do not spend time to modify or change the original format of your script, be it handwritten or in any digital format, text, audio, video, or even a combination of any of these. Just give it to us the way it is, and we will ensure that the transcription is done to the finest quality in less turnaround time. If you are a production house, a broadcaster, or even a distributor and want your script to be ready with shot logs, dialogue, timestamps, captions, V/O, music cues, and credits; just give us your requirements and we will make it a part of the transcript. Single movie script needs to be transcribed into different forms for different people associated with movie making like audience, technicians, artists, production executives, and directors, etc., to make their tasks effective and effortless. 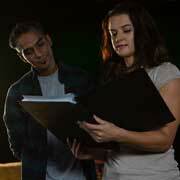 Movie scripts combine creativity and technical excellence of the highest level; therefore, it becomes the responsibility of a transcriber to pay more focus and dedication to deliver high quality movie transcript that meet unique demands of each individual. Why Outsource Movie Transcription Only to O2I? The reason to outsource movie script transcription to India and precisely to O2I is not just getting huge cost benefits. It is rather a combination of high quality and creative design delivered by seasoned movie transcriptionists, which cannot be achieved by non-professional or amateur transcribers. Additionally, we have all the required tools and software for specific transcription jobs, and a huge support team to ensure that every logistic and administrative aspect is taken care of to deliver high quality work. So, be it formatted transcripts, post production transcription, television transcription, audio transcription; at O2I we do it all as per your unique needs. By outsourcing transcription to a transcription company like O2I you are outsourcing your movie or video transcription to a specialized team comprising of film transcription experts, general transcription experts and software experts, who are acclaimed for offering unmatched quality services. Get the O2I Advantage, contact us today!